Thanks to everyone who sent me their book "unboxing" photo! Those who know me can attest that 2010 has been a year of significant change. 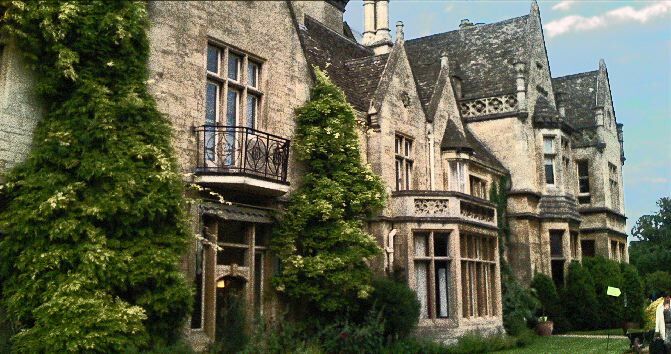 One project in long-term development declined, other long-term projects ongoing, contracts altered, my video suite moved, months in seclusion writing my book, some fantastic travel, and new interesting projects emerging. Of course, as any freelancer will tell you, this is par for the course, but even so, this year has felt like a sea change in the way I go about my business. 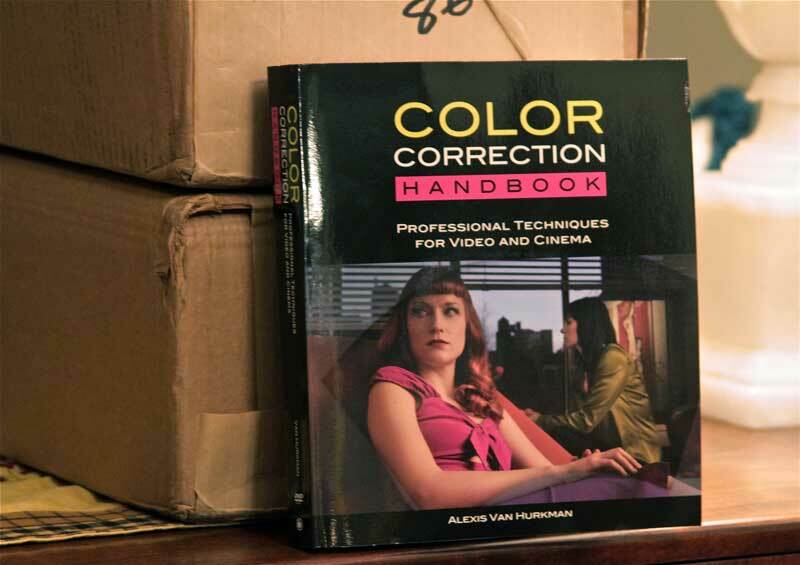 It’s probably no surprise that the professional highlight of my year has been finishing and shipping my Color Correction Handbook. I’m trying not to make this the “all book all the time” blog, however this has been a big deal for me, and from the numerous emails, tweets, and posts I’ve seen around the web, it’s being well received. While I’ve written many other books prior to this, what’s different now is the amount of actual direct feedback I’ve gotten. Prior to the Handbook, I’d write a book, send out a few review copies, and it would all sail into a black hole as I awaited my next quarterly report, wondering if anyone was buying or reading it. Thanks to this blog, Twitter, and a more direct connection to other folks in our industry via both NAB and IBC attendance (a first time in years for me), as well as other more professionally oriented social networking sites such as LinkedIn, I actually have a much greater sense of who’s reading my book, and what they’re getting out of it. It’s really quite nice. So a huge thanks to all of you who’ve made the purchase and shared thoughts with colleagues. There’s nothing better for book sales then word of mouth from professional peers, especially when shared via an online forum such as an Amazon.com review (one of which has been written already, I’m looking forward to more!). But enough about the book. Moving forward, my recent vacation throughout Belgium, Germany, and the Czech Republic has given me much food for thought regarding the link between medieval, renaissance, expressionist, and even art nouveaux works, and the artistic component of what we colorists do. 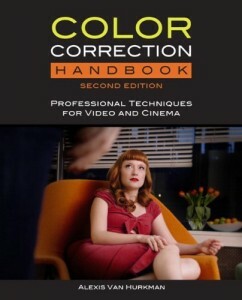 Now that the Color Correction Handbook has nicely summarized my investigations linking human vision, video engineering, viewer preference research and color theory, to grading technique in theory and practice, I’m turning my mind to the link between artistic visual representation and color grading adjustments. This blog should, in coming months, reflect some of these new investigations. It’s also my goal to finally conclude a certain animated science fiction pilot, as well as to initiate some brand-new fiction-writing that’s long overdue, keeping in mind that all work and no play, well, you know the rest. So Happy New Year to one and all! I hope your reflections on the past year are charitable, and that your anticipations of the coming year are filled with hope. Special thanks to @ryan_connolly, @markusrytilahti, @coolHandLucas, @ayumash, and others who’ve shared their “book unboxing” photos with me on Twitter. Whatever your religious persuasion (despite an alignment with secular humanism, I’m a Merry Christmas wisher myself), I did want to wish everyone happiness however you observe this time of the year. Frankly, it’s my belief that any holiday that discourages people from being assholes for at least a week or two deserves a shout out. In the spirit of the season, I wanted to share a documentary short that my wife, the actress/stylist/filmmaker Kaylynn Raschke, produced and directed a few years ago, called “Give the Gift You Hate.” It’s a fun look at giving, receiving, and the holiday season that’s sure to make you chuckle and reflect on all the stuff we give each other this time of year. It played at the Big Apple film festival last year, and this year Kaylynn decided to distribute it online for free. I hope you enjoy it! Click through to see the movie via Vimeo. Can You Hear the Words Coming Out of My Mouth? I was pleased to sit down with Patrick a few weeks ago, with the result being a three part interview series (nobody ever accused me of running short). The first two parts are up now, with the third yet to come. We talked about a wide-ranging series of things, and it was interesting. Things we talked about—Starship Detritus. Monitors. Client communications. How we see color. Why I write manuals. What colorists do. My new book. Stuff. The feedback I’ve gotten on Twitter has been pretty positive, so check it out; and check out Tao of Color. There’s some good info there, and Patrick is a good guy for sharing it (I also understand there’s a podcast series with not just my interview, but interviews with other interesting and insightful folks, all about color correction). Since I’m going on vacation later this week, I wanted to post one last article for the year, and I wanted to make it a good one. Grouping is one of DaVinci Resolve’s more powerful features. However, keeping control over changes you’re rippling among shots within a group can be a bit confusing. In this post, I’m going to try and sort out the dos and donts surrounding grouping and rippling on Wave-equipped Resolve setups (if you’ve got the full-blown DaVinci control panel, you’ve got more options, and you probably know what you’re doing already). I apologize in advance for the lack of illustrations, but this article is a big one, and I’ve had enough requests for this information that I judged it better to get this out the door a little faster for people who will benefit from it in their next few sessions, rather then to procrastinate until I have the time to screenshot everything lavishly. I think the content should be fairly clear, even without images. So let’s get to it. 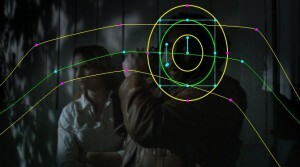 First, balance all shots in a scene to match using an identical number of nodes. Second, create a group and add all shots in the scene to it. Third, add more nodes to any shot to create a stylistic look for the whole scene. Once grouped, changes made to one shot in the group are automatically applied to the entire scene. 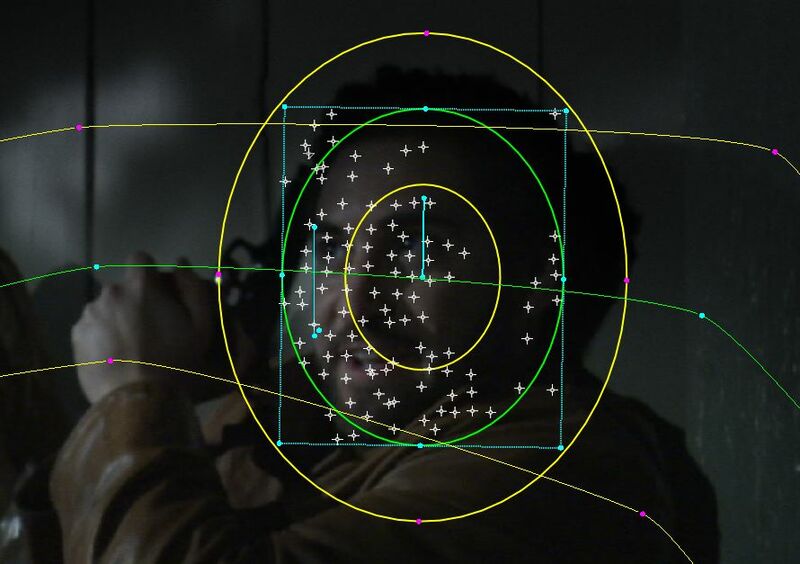 This is powerful, because it means when it’s time to make a revision, large or small, you don’t have to track down every single shot using the same grade so long as they’re in the group. You can create (as far as I know) as many groups within a single project as you need. You can add or remove shots from the current group, and the current group is defined by the last shot you’ve selected (if it belongs to a group, that’s the new current group). The result of following the very careful workflow I outline above is that your grouped scene starts out with one set of (balancing) nodes with varied settings relative to the other shots in the group. After grouping, you add a second set of (stylistic) nodes with settings that are identical to every other shot in the group. Both sets of nodes can coexist in harmony so long as you follow a few simple procedures and rules. Let’s begin simply, by balancing all the clips within a scene together so that they all match, and then grouping them so that they’re still balanced, and any change we make to one member of the group ripples the settings of the other shots in the group so that the relative offsets are maintained. Let’s consider a two-shot example first. Adjust node 1 in clip A to create the desired look. Adjust node 1 in clip B so that it visually matches clip 1, using different settings. Right-click clip A and choose Add Into a New Group, named FirstScene. Right-click clip A again, choose FirstScene > Change Ripple > Relative. Now, Right-click clip B and choose Add to Current Group. The second important part of the procedure is that we changed the ripple mode of FirstScene to Relative. 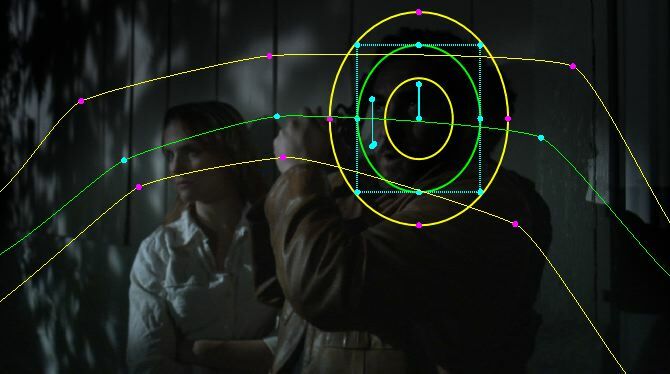 After following these steps, any change you make to a correction node of one clip will alter the same correction node in the other clips, by adding or subtracting the difference of your adjustment to the same node within every clip in the group. In other words, if you lower Saturation by 5 in node 1 of clip A, saturation will also be lowered by 5 in node 1 of clip B, so that the relative difference in saturation between node 1 of each of the two clips is preserved. The practical result that the clips stay matched despite any further tweaks. If you like, steps 3 and 5 can be consolidated by selecting each shot you want to add at once, to group them all together at the same time. Multi-select can be done using Cmd/Shift keys. If you change the group ripple mode to Relative last, however, you want to make sure you DON’T MAKE ANY CHANGES TO THE GRADES UNTIL AFTER YOU’VE SET GROUP RIPPLING TO RELATIVE. Making changes while the group’s ripple mode is set to either Absolute or Static will result in you losing the relative offsets that you’ve worked so hard to create, and this is NOT UNDOABLE. I’ll repeat that, you cannot undo mistakes you make when making groups, so be VERY careful. Once you’ve created a group, and after you’ve set that group’s ripple mode to Relative, you can add more correction nodes, as many as you want. Each new node will be copied to all the other shots in the group, and any changes to new nodes will be rippled identically to every other shot in that group, since they were already identical in their initial state. In this same group, we add a second serial node (node 2) to clip A. Adjusting node 2, we push the highlights of the shot towards blue. Node 2 will also be added to clip B, with an identical blue adjustment. Any further adjustments you make to node 1 continue to ripple, relatively, to the other clip in the group, so that the offset between node 1 of clip A and node 1 of clip B remains. However, changes you make to node 2 are identical. Using undo or applying a saved grade eliminates all relative offsets! When making adjustments to clips in a group (with Ripple set to relative), using Undo after making ANY adjustment to ANY node eliminates all numeric offsets in all shots within that group, making the grade of every shot in the group identical, and losing all of your careful balancing. That’s just the way that it is, so be careful. Also, if you apply a Saved Grade to one shot in a group, that grade will overwrite every single node that was originally applied to that shot, and this total change will be rippled to every clip in the group, making them all identical. In this case, it doesn’t matter if Ripple is set to relative or not. then choose Remove From Group. 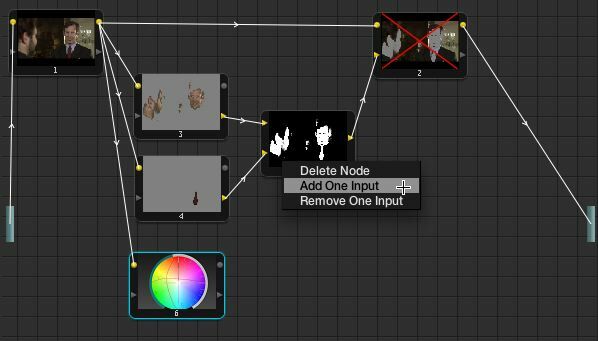 Make the necessary change to any node of that clip, but don’t add new nodes. When you’re done, Right-click the clip again and choose Add Into Current Group. The new offset between the clip you’ve adjusted and the other clips in the group is preserved, but all changes you make from now on are rippled, relatively, across every clip in the group. If you change the group ripple mode to Static, then any change you make to any node parameter will be automatically and identically applied to that parameter of that node in every shot of the group, overwriting any previous offsets. In other words, if the saturation of node 1 of shot A was 20, and the saturation of node 1 of shot B was 50, then changing the group’s ripple mode to Static and readjusting the saturation of node 1 of shot A to 30 sets the saturation of node 1 of Shot B to 30 as well. Even with Ripple set to static, previously existing offsets of parameters and nodes you don’t adjust retain their offsets. Lastly, to eliminate a group completely, breaking the group relationship among all shots that are members of that group, you need only right-click a shot belonging the group you want to eliminate, and choose “NameOfGroup” menu > Delete. This clears the group, while preserving the last applied grade within each shot. But that’s really enough. Groups will make your life much easier, but you need to handle them with care lest they make your life unwittingly more complicated. Good grading! 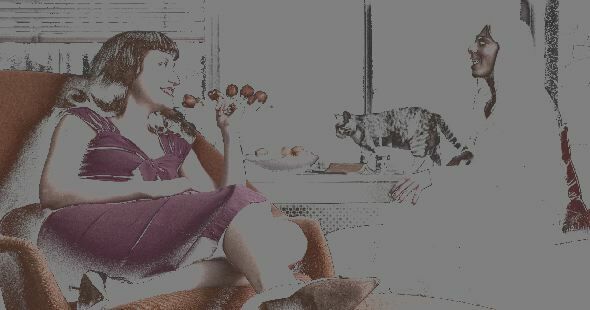 Funnily enough, this last week I’ve had three conversations about the importance of communication in the grading suite, two with different colorists of experience, and a third with the audience of the Dec. 2nd AENY user’s group during my Q&A. I’d already started writing this article (months ago, actually), but now seemed an appropriate time to get it out the door. Over the years I’ve worked with a variety of clients, both experienced and inexperienced. In the process, I’ve come to realize that it’s not enough to know how to evaluate an image, read scopes, make clever adjustments to enhance the talent and environment, have an awareness of the history of film and contemporary trends in cinematography, a knowledge of color theory, an artistic sensibility, and the know-how to work quickly and efficiently so as not to waste the client’s time and money. These skills are all vitally important, but unless you only work on your own projects, there’s one thing missing. The most important part of my job as a colorist is interpreting just what the heck the client is asking for. I don’t blame anyone for sitting behind me in the suite and saying something to the effect of, “I can’t tell you what I want, but I’ll know it when I see it.” I’m the one who decided to pursue this arcane task we call color grading, and as a specialist it’s my job to provide options and recommendations—that’s the whole point. So I see it as my job to bridge the gap between the image as it sits on my display, naked and quivering, and the inner vision of my client, longing for the visual greatness they know should somehow be there. And yet this can be challenging. An anecdote I like to tell is of the client who insisted “you need to make the image brighter.” Now, since I’ve always tended to equate “brightness” with what is technically a “lightening of the luma of the image,” I raised the midtones a bit. I was wrong. “That’s not right, make it lighter.” Momentarily disarmed, I tapped my chair arm as I tried to think of what else he could mean. On a lark, I raised the saturation. “That’s it!” he exclaimed. “Perfect, it’s much brighter.” And so the session proceeded. The point is not that the client was perhaps not using the terminology as I would have defined it. The point is that the client clearly articulated their need, and it was my job to interpret that need, and translate it into an adjustment. That’s fine, but in that vein I’ve often wanted to offer a sort of crib sheet, breaking down the fundamentals of image evaluation, in order to provide a glossary to help bridge the gap a little bit faster. That said, here is a client-friendly image analysis primer, intended to provide a quick orientation prior to any grading session for folks who are looking for a bit of insight. 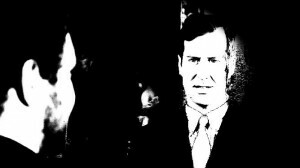 Top: The original, dark image. Bottom: Made brighter by boosting the midtones only. The foundation of the image is whether things are darker or lighter. Most folks correspond “brightness” with how light something appears, although this isn’t always the case. Usually when people talk about lightness, they’re talking about the midtones and highlights of the image. The way we colorists look at things, every image can be divided into three regions—the shadows, midtones, and highlights. The shadows and highlights speak for themselves. The midtones, as the name implies, include everything in-between the darker shadows and the ligher highlights (for example, people in the frame often fall into the average midtones). Most color correction applications have a lot of control that can be exercised over the lightness or brightness of the image. Hilights can be made darker, shadows can be made lighter, and the image can be darkened or lightened either overall, or within specific regions of lightness or brightness. 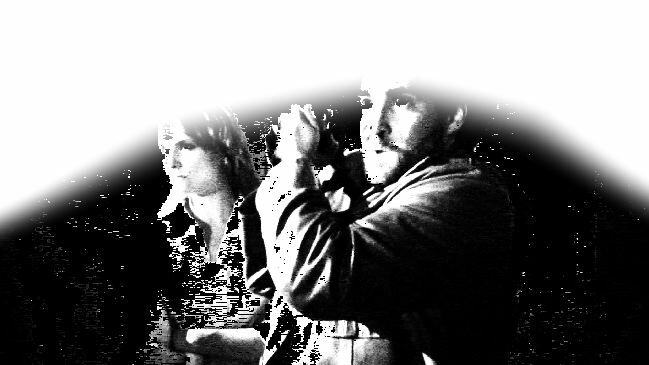 For this reason, it’s also perfectly fine to ask for a specific part of the picture to be darkened or lightened. 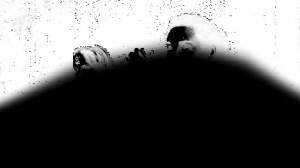 Here’s one other thing to think about: While the shadows and highlights are (usually) broad regions of the image, the black point represents the darkest thing in the picture and the white point represents the absolutely lightest highlights. It’s possible to brighten the lighter shadows while leaving the black point deep and dark. The result is a limited adjustment to Contrast (covered next). Image lightness and contrast are intimately linked. Top: Original, low-contrast image. Bottom: Higher contrast by dropping shadows and boosting highlights together. “Make it more contrasty” is a common request. It’s also a good request. Contrast is a measurement of the difference between the brightest and darkest parts of the image, so it follows that raising image contrast involves either brightening the highlights, darkening the shadows, or (frequently) both. The result of a reasonable contrast boost is often a more striking image that appears cleaner and crisper. The result of boosting image contrast too much can be clipped shadows, blown-out highlights, and increased noise in the middle of the image (but hey, some people like that too). Of course, it’s not all more. 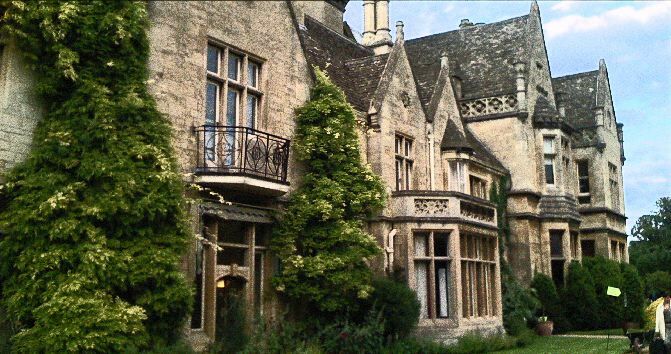 Lowering contrast is often appropriate if the goal is to create a more subdued look (lowering the light levels to make it appear to be evening, for example). Day-for-night adjustments often benefit from compressed contrast. Either way, don’t be afraid to be specific about contrast, since contrast can often be tightly controlled within specific regions of the image. Top: A muted, low-saturation image. Bottom: A highly saturated image. Saturation refers to the intensity of a color. 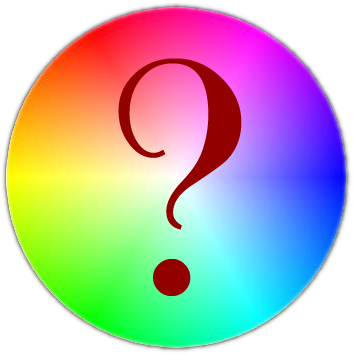 Pale, pastel colors are less saturated, while vivid, rich colors are more saturated. So, if an image looks a bit dull, it might be a matter of raising the saturation. Conversely, if an image seems busy or distractingly colorful, lowering the saturation is a good fix. As with all things, targeted adjustments to the saturation of specific elements within the image are possible, and in fact this is one of the most frequent types of targeted corrections I make. All available colors distributed around a standard video color wheel. This is the one thing I don’t need to explain. 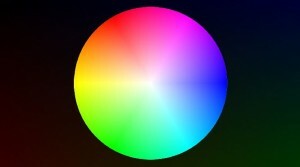 Hue is simply the name of the color you’re referring to. There’s no need to get tricky with fancy color names. Even though there are a zillion of ’em, I personally tend to stick with the ones that were used in the small box of crayons (I could never remember all the ones in the big box). The truth is, at this point in my career I often find myself thinking in terms of the Vectorscope’s angular distribution of hue, but you probably didn’t want to know that. Top: A “cool” blue treatment. Bottom: An orangey “warm” treatment. Describing an image as “cool” or “warm” might sound artsy, but don’t worry about sounding like a cliché. If you’re describing naturalistic lighting, the physics of the light sources all around us dictates that lighting actually does range from warm reddish-oranges to cool blues, relative to the temperature of the illuminating light source (the illuminant, if you like 25¢ words). Candlelight is considered warm, noon-time sunlight, especially on an overcast day, is considered cool. Sunrise, sunset, candlelight, interior incandescent lighting, bonfires and sodium-vapor streetlights are all variations on reddish-orange, warm lighting. Noon-day sun, overcast days, properly filtered fluorescent and compact-fluorescent lighting, and computer/TV/cell phone displays are variations on white-blue, cool lighting. Nearly all natural and many man-made light sources fit along a sliding scale from red-orange at the warmest, to blueish at the coolest, so describing a “temperature” actually makes all the sense in the world. If you describe a shot as being hot, warm, luke-warm, cool, cold, or icy, I’ll get what you’re saying. Along the same lines, there’s a question I’m fond of asking in the suite; “what time of day is it?” Whether an exterior or an interior, the time of day the audience is supposed to perceive gives me a valuable clue as to what quality of light will elicit the desired response. On the other hand, don’t feel the need to limit yourself to the colors of nature. Even though artificial fluorescent lighting appears white to the naked eye, it can lend a “greenish” cast to a scene recorded to film or video as the result of being improperly filtered or white balanced. While technically that’s an error, many directors and cinematographers have also used this as a creative choice. So, even though it’s distinctly unnatural, greenish lighting has entered the repertoire of the contemporary colorist, as well. What, Exactly, Do You Want Me to Change? Top: The original grade. Bottom: selectively making the man’s shirt more vibrant (nothing else is changed). Honestly, you don’t even need to articulate why you don’t like something; the important thing is that if there’s a visual element that’s bugging you, tell me, I’ll figure it out. And I’ll be sure to let you know when there’s something that I think needs addressing. 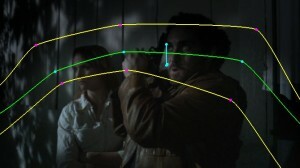 All modern color correction software has the technology to make specific, isolated changes like these. While there are a variety of tools with which to do so, all you need to do is tell me what needs fixing, and I’ll figure out how to get it done. However, those are the basics. While there is obviously much more to the art and science of color correction, in terms of general communication, this is a great foundation to start with, and I hope this helps you to identify individual specifics of images that you want manipulated when working with your friendly neighborhood colorist. Special thanks to Yan Vizinberg, Abigail Honor, and Chris Cooper for images from Cargo, Lauren Wolkstein for images from Cigarette Candy, and Bill Kirstein for images from Osiris Ford. Yes, I got a haircut (if you’re used to my Twitter picture, I do need to update it). I was in Barnes & Noble to buy a Blu-Ray copy of “Stardust,” a movie I quite like and wanted to watch with my wife and her family (visiting for Thanksgiving week). Honestly, I had no intention of feeding my writer’s ego going in, but it did occur to me to check whether my book was being stocked (one never knows). Fortunately for my ego, it is. So if (two of) you happen to be looking for a copy of The Color Correction Handbook, and you’re at the 86th St. Barnes & Noble in New York, then you’re in luck. More to the point, the book’s being stocked on actual shelves by at least one large vendor, which means if you’re too impatient to wait for the FedEx/UPS truck to arrive, your chances of grabbing a copy at your local bookseller aren’t bad, at least if your local bookseller happens to be, well, you know, Barnes & Noble. I’m curious to hear what other stores might be stocking copies (the idlest of curiosity, I assure you). If you spot any in the wild and are so inclined, please drop me a note in the comments. And if you’re a repeat visitor to my blog, please rest assured that I won’t be going on about my book in every post. However, it’s not every year I come out with a new book, so I hope you’ll indulge me. When you write a book, the publisher stipulates that you get a certain number of author copies, delivered straight from the printer. Well, the FedEx guy dropped off my two boxes of books this week, followed almost immediately by Amazon declaring the book’s availability. After seven months of intensive writing, research, experimentation, and editing, my new book on color correction is on shelves now! To see the scope of it, click here for a downloadable table of contents in PDF form. 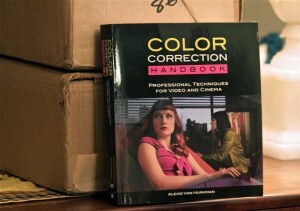 “The Color Correction Handbook: Professional Techniques for Video and Cinema” consists of over 530 pages of cross platform fundamentals, tips, and techniques covering the art and process of professional color correction for film, broadcast, or the web. I’ve worked hard to create a book that will be as useful to the novice who’s just starting out in this field as it is to the veteran colorist who’s looking for deeper information on the latest in vision science research that applies to the task of grading. 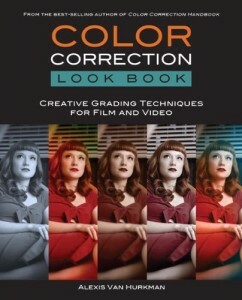 No matter what level you work at or what grading application or NLE you use, this book will be a valuable addition to your library of color correction knowledge. I’ve written my book to be applicable to as many applications as possible, with screenshots and information about Assimilate Scratch, FilmLight Baselight, Quantel Pablo, Iridas SpeedGrade, and Apple Color, this is also the first book to show techniques as they apply within the new version of DaVinci Resolve that’s available for Mac OS X and Linux. If you’re one of the many who are stepping up to using DaVinci Resolve for your color grading, this book is an absolute must have. Building upon the best of the content found in the Encyclopedia of Color Correction, The Handbook is a complete rewrite focusing on dedicated grading applications, with considerable expansion to add more background, completely new examples with all HD media (most of which is included on the accompanying DVD-ROM), and entirely new chapters for subjects including grade animation, scene balancing, and memory colors & audience color preferences, much of which has never before been covered in a book on this subject. The Handbook culminates with a 63 page chapter on creative techniques, providing a cookbook of highly customizable looks and stylizations that can be mixed and matched including cross-processing simulation, vintage looks, day for night techniques, bleach-bypass, and many more. Altogether, these techniques providing a valuable foundation of creative grading methodologies upon which you can build for any type of project. …it was an absolute pleasure to work on and I was able to stay in touch with my alma mater Engineering College’s motto “Thorough“. …Alexis has put together a very nice progression and builds its complexity outward around a very deep core understanding. For me personally, it came home again that one gains a deeper comprehension—plus there’s always something out there to be discovered and/or re-modelled—when working through or teaching a process like this. It was like colorist college or daVinci Academy again for a couple of months of intense review! It’s the real thing. Click here to check out the downloadable table of contents, and if you like what you see, click the link over to the right of my blog and buy yourself a copy. And please, let your colleagues know this book exists, I can really use your help to get the word out! Lastly, for those of you who are interested in getting a digital copy of the book, rest assured that one will be available soon, I’ll let you know where and when just as soon as I find out. 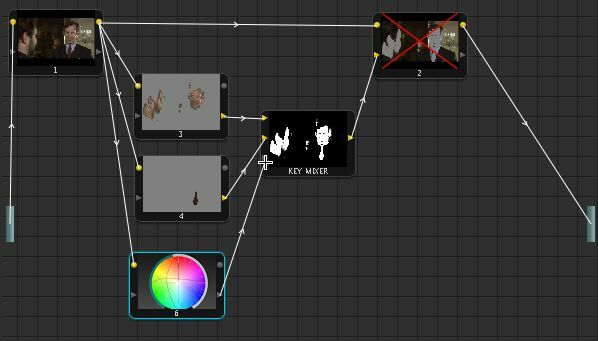 Continuing where part I left off, it’s time to look at how we can combine the mattes that are output by several nodes using the Key Mixer node. It’s a long one. A Key Mixer node combining multiple mattes generated by different nodes. Why is this important? Because the technique of combining mattes is accomplished using the Key Mixer node, which takes multiple key channels as its input, allowing you to combine them in various ways in order to output a single key channel, which you can then plug into any other node’s “key input” with which to define a secondary operation. This isn’t a technique you’re going to use every day. However, the following example shows what I consider to be one of the Key Mixer node’s primary uses, which is to allow you to create mattes that combine multiple HSL-qualified keys for shots where you simply can’t get satisfactory results from a single HSL key. But enough jibber jabber. Let’s check out an example. The following shot (which happens to be available on the DVD-Rom that’s included on my new book), has a single primary correction to adjust contrast and color. The initial correction node and its result. However, the client wants to throw an orange-red wash into the room. Adding another node (to make it easier to back off this more stylistic correction in case the client changes his/her mind), we make the change. Adding a second node with a stylistic correction. 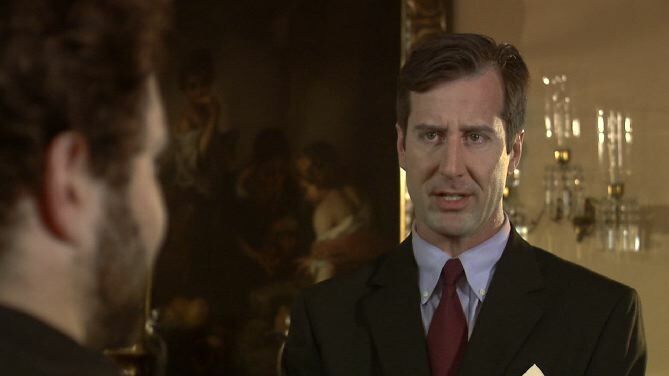 Unfortunately, the amount of color the client wants gives the actors a sunburn, and changes the color of the man’s shirt from blue to a purple-pink that’s not quite what wardrobe had intended. Now, one easy fix would be to apply the colored grade as a secondary operation, using HSL Qualification and Power Windows to isolate the skin tone of the faces, preventing the “accidental sunburn” look by limiting the correction to the outside of the secondary key. Unfortunately, this does nothing to preserve the color of the shirt and tie, and in fact trying to isolate the oranges, maroons, and blues of these features all in one operation would require an impracticably wide sample. This is a perfect instance when combining several discrete keys will give us a better result. To do so, we need to do some rewiring of our node tree, but to understand how we need to take another look at how node connections work. The following illustration shows the two types of node connections that you can make. The two types of node inputs and outputs in Resolve. The circles at the top left and right are the targets used for routing RGB image data from one node to another, which is what we’ve been connecting nodes with so far. However, the triangles at the bottom right and left are the targets used for routing key channels from one node to another. Connecting node 1’s key output to node 2’s key input lets you use the key from node 1 within node 2. However, this isn’t hugely interesting until we add another type of node to the mix. Right-clicking within the Clip tab opens a shortcut menu, within which is a submenu you can use to create new, disconnected nodes. Within this list is a node called the Key Mixer. Creating a Key Mixer node using the shortcut menu inside the Clip tab. 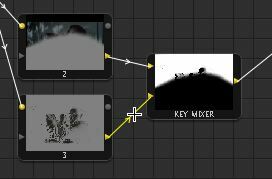 The Key Mixer node can take multiple Key channels from several nodes (as many as you’ll practically need), combining them into a single key that you can then feed into another node to use for secondary correction. Let’s go ahead and wire up the node structure we’ll need. First, we’ll use that shortcut menu to create a Key Mixer node and three Corrector nodes (corrector nodes are the same type of nodes that are used when you add Serial or Parallel nodes); essentially we’re adding one Corrector node for each feature we want to independently isolate using HSL Qualification. Once the nodes are created, we want to drag connection lines from the RGB output of our original primary correction node 1, and connect them to the RGB inputs of the three Corrector nodes we’ve created. 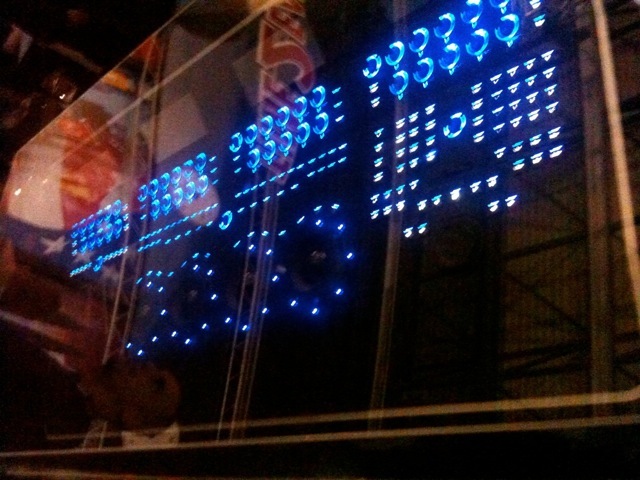 Note that one RGB output can feed as many RGB inputs of different nodes as you like. Next, we want to connect the triangular Key outputs of the first two corrector nodes to the triangular key inputs of the Key Mixer node. 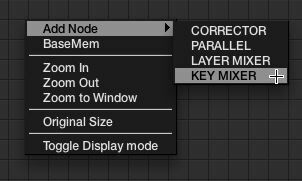 You’ll notice that the Key Mixer node only has two inputs; if we want more, we need to create them by right clicking on the Key Mixer node and choosing “Add One Input” from the shortcut menu. You can add as may inputs as you need, they’ll all get crowded into the space at the left of the node. Adding a node input to a Key Mixer node. With the extra Key input created, we can connect the last Corrector node’s Key output. Lastly, we want to connect the Key output of the Key Mixer node (which is outputting the sum of all keys that are input to it) to the Key input of the node that we had originally created to carry the “stylistic” color change. The result should look something like the following. Connecting the third corrector node to the new node input. You should note that, until all of the nodes are properly connected, their thumbnails won’t reflect the flow of image data, instead showing the generic node icon. This lets you know which nodes are connected and having an effect, and which nodes aren’t. With the node tree wired up, now all we need to do is key each element we want to isolate as tightly as possible. Another advantage of this technique is that each individual node can use a combination of HSL qualification and Power Windows to create an aggressive and well-isolated key. The three keys to be combined. With the faces, tie, and shirt independently isolated, selecting the Key Mixer node and turning on the Highlight checkbox in the Qualifier tab now shows us the sum total of all three keys added together. By default, the Key Mixer is set to combine all input Keys in an additive way. Examining the key created by the Key Mixer node with the "Mattes display high contrast black and white" option turned on in the Settings tab of the Config page. Looking at the final result, we can see that while the stylized correction is still affecting the background, hair, and clothing of the actors, the areas we’ve keyed are now protected from this effect. This is exactly what we want, so we’re done. However, that’s not the end of the story. Now, let’s take a look at how we can use the Key Mixer to subtract one node from another. Using the image from Part I, we’ll recreate the same effect, this time subtracting an HSL-qualified key in node 3 from a Power Curve key in node 2, as set up in the following node tree. Redoing the example in Part I using nodes, instead of internal window/HSL interactions. When we first set this up, the two keys are automatically added together, just like in the previous example. The initial, additive key combination that is the Key Mixer's default behavior. However, what we really want to do is subtract the faces from the “headroom shadow” shape in order to preserve the highlights on the actors. To do this, we’ll select the Key Mixer node and use the controls found in the Key tab. The Key tab contains additional parameters for altering the key data coming into a node, and the key data going out of the node. The Key tab contains parameters that govern the keys that are connected to the Key Mixer node, specifically how they interact and whether or not they’re inverted. You’ll notice that there’s only one set of parameters even though there are two inputs coming into the node. This is because you need to select the connection line that corresponds to the node key you want to adjust in order to expose the parameters for that particular key. Click a connection line to edit that key's parameters in the Key tab. After selecting the connection line attached to the second input (selected lines are yellow), the Key tab shows the parameters for INPUT LINK 2. These parameters are similar to those found in the Window tab. In particular, clicking Mask (subtract from), and then turning on the Invert checkbox sets this input up to subtract itself from the other key connected to input 1. Setting one node's key to subtract from the others in the Key Mixer node's Key tab controls. The result can be immediately seen if we turn the Highlight checkbox on in the Qualifier tab. The key in node 3 is now subtracted from the key in node 2. At this point, we’ve got the matte we need, and we can select node 4 and lower the midtones to darken the above area. Unfortunately, the result is that the black portion of the key has gone darker, instead of the white portion. What’s up? You need to turn off the Invert parameter of the External key to get the effect you want. If you open up the Key tab while node 4 is selected, you’ll see two sets of parameters. The External Key parameters govern the behavior of keys that are routed to that node via the Key Input connection. By default, the External Key parameters of new correction nodes have the Invert checkbox turned on. Turning this off correctly sets the node to darken the top region, rather then the bottom. 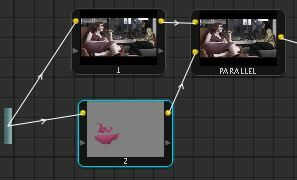 Turning off Invert for the external key in node 4 to change which portion of the image we're grading. The resulting node tree thumbnails show how all the keys are interacting as they’re fed from node to node to node. The final node arrangement, with each node's thumbnail reflecting the current key settings. The end result, while in need of refinement, shows the correct effect. 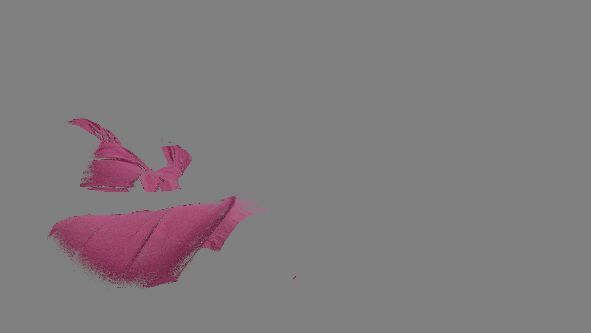 The final image, showing the result of all this fancy nodal footwork. And that’s all there is to it. Good grading! 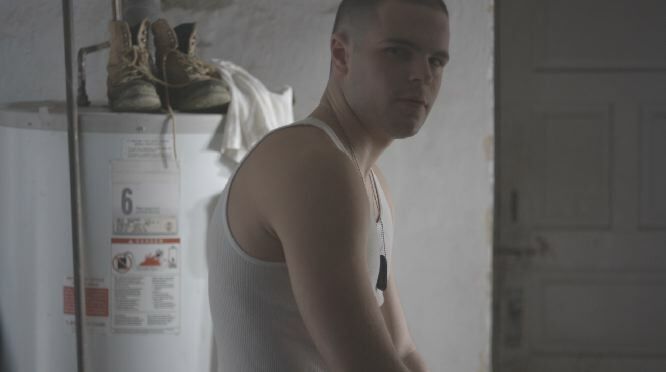 Special thanks to Director Bill Kirstein for clips from Osiris Ford. While I’ve been running DaVinci Resolve for the past three months at home (never thought I’d ever hear myself say that), and lugging my Resolve CPU back and forth from my home office to my client suite in NYC’s Chelsea district, I finally got sick of hefting my 45 lb (with drives & cards) Mac Pro back up to my 4th floor walkup, and upgraded my suite machine. All the stuff I crammed into a 2010 8-core Mac Pro. As I mentioned to one of my colleagues at Twitch Post (where my suite is located), this is the first time in years that I’ve stuffed every single slot and bay of a tower absolutely full. In this case, it’s a 2010 8-core Mac Pro. In the image at top you can see, from bottom slot to top, an Nvidia GeForce GTX 285, GeForce GT 120, DeckLink HD Extreme 3D, and RED Rocket. I moved the bootup drive into the unused optical slot (using Noiseblocker X-Swing drive brackets from OWC), and filled all four drive bays with 2TB Western Digital RE4 enterprise class drives, striped into a whopping 8TB array. In other words, I turned the machine into a space heater (just in time for winter!). After a late Friday night shakedown (conforming and lightly grading a RED spot I graded earlier in the year), all’s well and everything’s working. Updating Nvidia’s CUDA drivers via their System Preferences panel seems to be down at the moment, but downloading the newest CUDA drivers directly from Nvidia’s web site for installation did the trick. Eventually I’ll investigate a PCIe expander chassis—the only reason I’m running an internal RAID is because there’s no extra slot for external accelerated storage—at which point I’ll probably invest in something like the Sohotank ST8. However, the Blackmagic disk speed test application claims that my internal array is getting just a bit over 500 MB/sec performance (which I have a hard time believing so I want to retest using other software), and in any event disk performance is completely fine for the ProRes and R3D-based projects I ordinarily work on. So that’s it. New kit is always fun, and especially so when the upgrade is so painless. The system runs either Color or Resolve, but the truth is that I’ve migrated most of the client work I do over to Resolve at this point given the faster render speeds and RED Rocket integration. Admittedly, it’s been a month since my last blog entry, but in my defense I’ve been a bit busy what with completing my new color correction book (which is at the printer as I type this) grading a pair of programs, and random other varied projects. However, there’s a topic I’ve been really wanting to show, as it’s one of the things that Resolve’s nodal approach to grading allows that’s quite nice, and that’s how to combine multiple mattes in different ways. Combining mattes is an extremely powerful technique that any compositing artist should be familiar with. The general idea is that you can add two mattes together to create a more complicated matte, or you can subtract one matte from another to “carve out” elements you don’t want to be included. To begin with, we’ll take a look at one of the most common examples of matte intersection, which can be accomplished within a single node. The following ungraded night shot is generally lit the way the client wanted it. 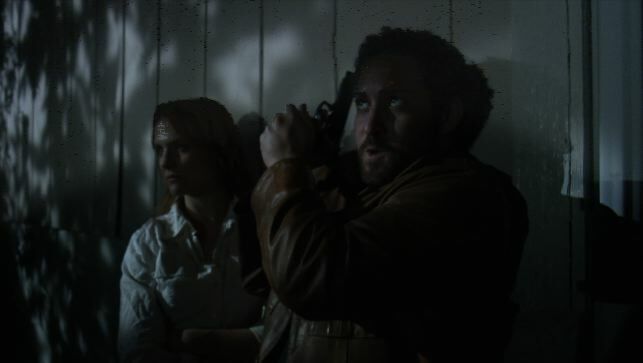 I suggested cutting down the amount of ambient light above their heads to focus the lighting more on the actors, while portraying a “darker” night as a result. 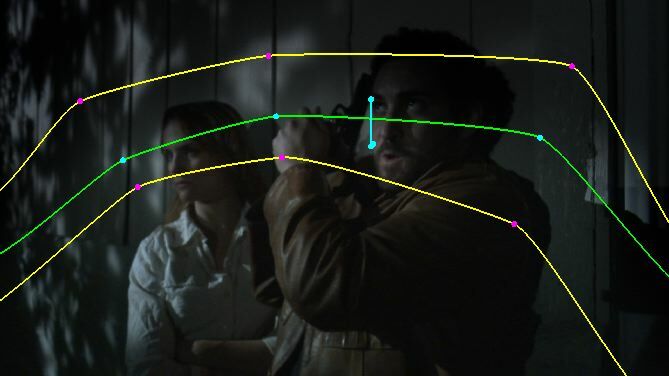 The quickest way to do this is using a custom shape (or PowerCurve to use DaVinci Resolve’s terminology), to isolate an arc above the actors heads, within which I can then use the contrast controls to darken the background. Darkening the region above their heads with a Power Curve. The result, while pleasing in terms of how the environment looks, unfortunately also darkens the man’s face. This is not helpful at all. 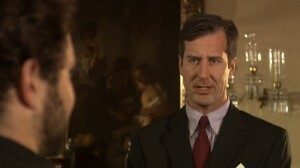 The man's head is undesirably darker as a result. 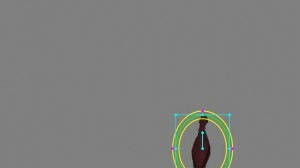 One solution would be to alter the shape of the “darkening” Power Curve to exclude his head, but thinking ahead, the man is going to be moving later in the shot, and animating the whole shape is going to be a pain in the neck. Instead, I’ll use Resolve’s ability to combine multiple shapes in different ways to subtract a Circular shape from the one I’ve already created. First, I turn on the Circular shape in the Window tab. 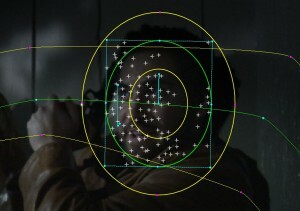 Each node in Resolve can have up to four shapes applied within, one of each type of window, Circular (oval), Linear (rectangle), Polygon, or Curve (bezier-based shape). 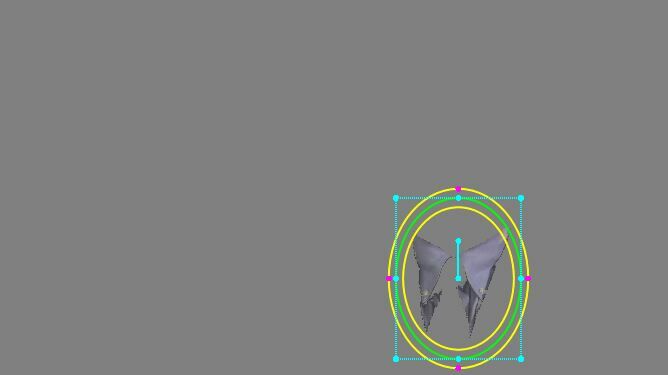 To combine shapes, you merely need to turn on the ones you want, and in the case of the Polygon or Curve, draw them. 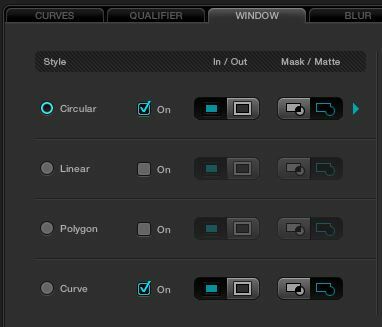 Combining Circular and Curve "windows" (or shapes) in DaVinci Resolve. Next, I position the resulting oval shape to cover the man’s head, which I don’t want to be included in the large shadow I created at the top of the frame. Intersecting a Circular window with a curve. 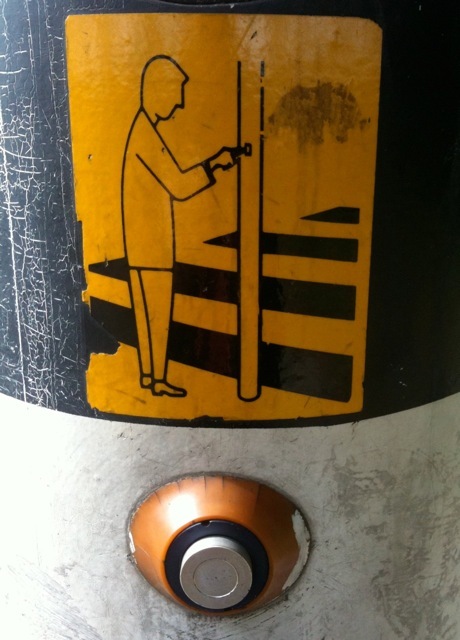 The Circular shape covers the man's face. 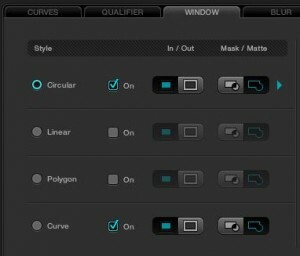 Each of the four shapes in the Window tab has a Mask/Matte control at the right of the other onscreen controls. The default setting is Matte, which adds each shape you turn on to the rest. 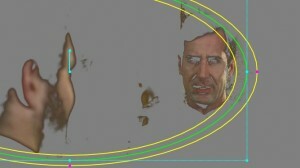 However, when you set a shape to Mask, that shape instead subtracts from the other shapes you’ve turned on. Switching the Circular window to Mask subtracts it from the Curve, rather then adding it. With the Circular window set to Mask, we can now see that the man’s head is subtracted from the original darkening matte. The Circular window, seen subtracting from the original Curve window. The practical result is that the man’s face is no longer darkened. The man's face is now protected from this darkening. The other advantage of this arrangement is that, as the man moves his head, we can now motion track the Circular window using DaVinci Resolve’s ridiculously fast, simple, and accurate tracker, and the “facial protection” window will move through the background shadow like we’d expect it to. Motion tracking the man's face so that the Circular window follows him as he moves through the background shadow we've created. So that’s the simple example. In part II, we’ll see the more complicated example, showing how to to do the same thing, instead using multiple nodes rather then multiple shapes, an even more flexible technique. To answer Ron’s last question, the ALT button doesn’t do anything to the best of my knowledge. Pretty neat for a low-cost grading surface. Those of you who know my love of detail ought to get a chuckle out of this one, for I will regale you with a tale that begins, simply, with an explanation of the workings of one of DaVinci Resolve’s reset buttons, and ends with an explanation of the difference between the two different ways you can adjust luma contrast in Resolve. However, let’s start with a look at the RGB reset button, specifically, found on either the Wave or DaVinci control surfaces (I’m not picking favorites, those are the only two that are compatible with Resolve at the moment). Trust me, this is going to get interesting. I’ll speak to current and future owners of the Tangent Wave panel first, as I suspect there are rather more of you out there. 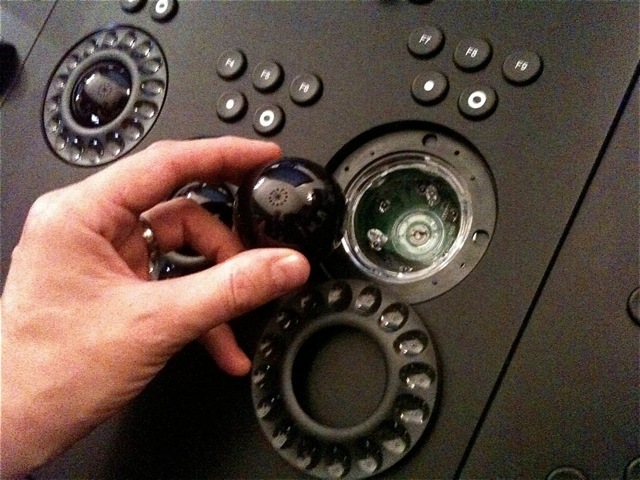 There are two reset buttons found next to each trackball/contrast dial pairing for lift, gamma, and gain. 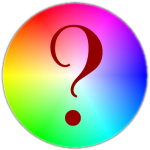 The top button (circle) resets both color balance and contrast to the détente position (a value of 0 for the Y’, R, G, and B channels). Meanwhile, the bottom button (dot) resets only the R, G, and B channels. This arrangement is different then for Color, where one button resets RGB only, and the other resets Y’ only, but that’s the way it is with learning new software, something’s always different. In the following image, I’ve expanded contrast by raising the gain and lowering the lift controls using the dials on the Wave control surface to create an image with excessive contrast. Next, I’ll make a ham-fisted adjustment so the highlights of the image are really, really blue. Coming to my senses, I decide that the blue adjustment is actually ridiculous, but I still like the expanded contrast, so I press the RGB reset button (dot) corresponding to the gain controls on my Wave panel to reset the color but not the contrast. The result is an image that’s now less saturated then it was in shot #2, before I made the blue adjustment. What gives? The answer to that just happens to dovetail with one of the things I really like about DaVinci Resolve, which is that there are actually two very different ways you can adjust image contrast, depending on your goals. The first set of controls are the three large dials on the Wave (or rings on the DaVinci surface) that adjust contrast by raising and lowering Y’RGB all together, which you can see if you look at the indicator bars on the interface. Using these, expanding contrast also raises image saturation, and compressing or lowering contrast results in lowered saturation. These controls are great for making bold changes to color and contrast all together, and for expanding flatly shot images into their full glory without needing to also raise saturation. ADDITION—It’s been pointed out to me that middle-clicking and dragging up and down within any Y’RGB slider group for Lift, Gamma, or Gain will uniformly raise or lower Y’RGB as if you’d used the control surface dials. However, in the second page of commands for the knobs and buttons along the top of the Wave (or via a dedicated set of three knobs on the DaVinci surface) there’s a second set of Lift/Gamma/Gain controls that let you adjust the Y’ channel independently of the RGB color components. Using these, expanding contrast does nothing to numerically alter image saturation, but saturation diminishes perceptually relative to the change we’re making to the Y’ channel. Conversely, compressing or lowering contrast with these controls appears to raise saturation. The effect is the same as if you used the Y’ vertical sliders and Lum Gain/Gamma/Lift horizontal sliders both adjust only Y’. These controls are great for altering shadow density, for getting punchier blacks without changing the color too much, or for fixing specific broadcast legalization issues. When we raise highlights, Y’RGB all go up together. When we then alter the color balance towards blue, the R channel diminishes while the B channel increases and Y’ remains unaltered. When we reset RGB, the R, G, and B channels all go to 0, while the Y’ channel remains elevated where it was. This is why saturation diminishes, because the net result is that you’ve raised Y’ independently of RGB. So now you understand the default behavior of the RGB reset button, you can determine when its functionality best suits your needs, and as an added bonus you got a window into the dual sets of contrast controls that Resolve makes available to you. Special thanks to Director Jake Cashill for clips from Oral Fixation. 9/27/10—Added a correction about the ability to adjust Y’RGB by middle-clicking and dragging onscreen Lift/Gamma/Gain sliders. 11/14/10—Added to the preamble of the article. 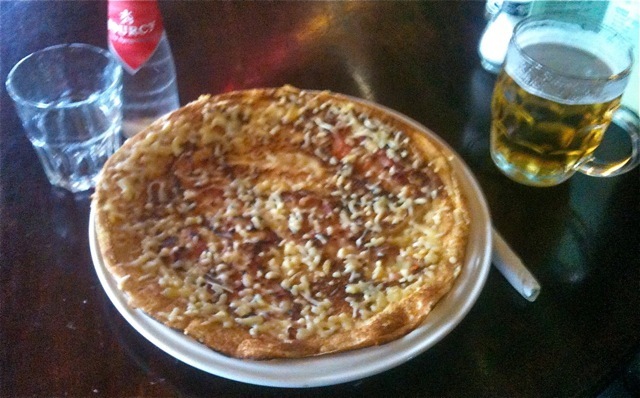 A bacon and cheese pancake and a beer at the Carousel restaurant. After a nearly 8 year absence from both IBC and Amsterdam, the opportunity to meet several European colleagues I’ve not seen in a while was too good to pass up, so I decided at the last minute to attend the show. And I’m glad I did, it was a great time. I’d forgotten just how big IBC was, in fact it seemed quite a bit larger then NAB was this year, with packed-in booths taking up nearly every corner of the not-inconsiderably sized RAI center. Frankly, I was there primarily to chat with other colorists and postproduction colleagues I’ve met over the years, as well as software and hardware vendors who’ve been generous with their time in terms of helping me with my book, so I didn’t really scour the showroom floor as thoroughly as other blogging-minded folks. However, given my obvious areas of interest, there are a few tidbits I picked up on that seem worth sharing. The folks at Quantel showed me some of their new developments, which includes a new noise reduction option, Cinnafilm’s Dark Energy, that provides noise reduction, grain addition, and sharpening. I saw a demo which impressed, and I liked the simplicity of the interface—even though there’s a matrix of inscrutable values that you can tweak if you’re in the mood for excessive noodling, the core functionality is to sample a region of the picture with a bounding box to get the grain structure, and then dial the amount of removal up and down as needed. The “quickie” results were quite nice, I’d be interested in seeing how much more quality additional massaging of the other parameters would get you. The Quantel Neo control surface was cooler-looking then the noise reduction UI (which worked great). In an uncharacteristic move for Quantel, they also showed a software-only assist station, running on Windows 64. Positioned as a lower-cost way to provide assistants with an environment to do project management and other preparatory tasks for handoff to the hero room later on. Also, Quantel has added the ability to soft mount RED media in the Pablo and IQ, accessing the media directly without having to ingest it and convert the format. Now, this isn’t news in the desktop world, but this, in conjunction with compatibility with the RED ROCKET acceleration card, demonstrates their interest in getting involved more deeply with RED workflows of different types. After thrusting a hand-held configuration of the new EPIC camera into my hands (yes, a working version) RED’s Ted Schilowitz also took some time to chat. Quantel’s support of RED features is indicative of the kind of support that pretty much every major color correction application provides these days, meaning that RED workflows aren’t the rare bird they once were. Additionally, support of the RED ROCKET by most current grading platforms means that real-time 4K post workflows are within $5K reach of most post houses existing investment if their platform is compatible (or $10K if you need two for 3D work). 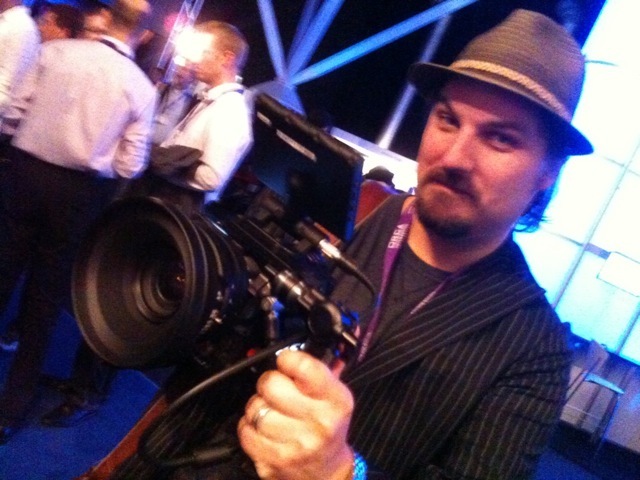 Pretending like I know how to operate the Epic. Getting back to the EPIC, it was amazingly light, given that it was entirely self-contained. The lens was one of the heavier parts of the rig (and it was a big piece of glass). One-armed use would not be out of the question, if you’re in fighting cameraperson trim. Bopping over to the FilmLight booth (they’ve been giving me a lot of screenshot and information support on use of their software for my book), I chatted with Mark Burton briefly. While not showing any particularly new BaseLight features, he discussed some of their new workflow contributions, including the addition of 3D playback and convergence adjustment to their TrueLight Player, intended to provide support for on-set review during 3D shoots. What’s interesting to me is that a list of shots can be assembled and aligned, and that list can be saved as a BaseLight project, moving the media and metadata smoothly into the beginnings of postproduction. The more shoots go all-digital for acquisition, the more interested I become in different application’s ability to manage not just the media, but the associated metadata communicating on-set decisions to the postproduction professionals who are grabbing the baton. 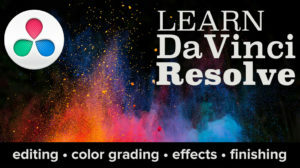 Speaking of color correction, DaVinci finally announced that they’re shipping Resolve (which I’ve been beta testing for a while). From my experience so far it’s a really stable application, despite it’s brand-new incarnation on the Mac OS X platform. Now, I try not to take sides; all the color grading solutions I’ve seen and tested have their high points, and I honestly think you can do great work on any of them. However, having been using Resolve on OS X long enough to form an opinion, and being particularly interested in (relatively) low cost yet professional solutions available to mid-range post professionals, I do want to say that the performance I’ve experienced on my properly configured system (see the Configuration Guide) has been exceptional. They’ve also released a new version of the Resolve Manual, which I read on the plane over. You should check the docs out if you’re at all interested. 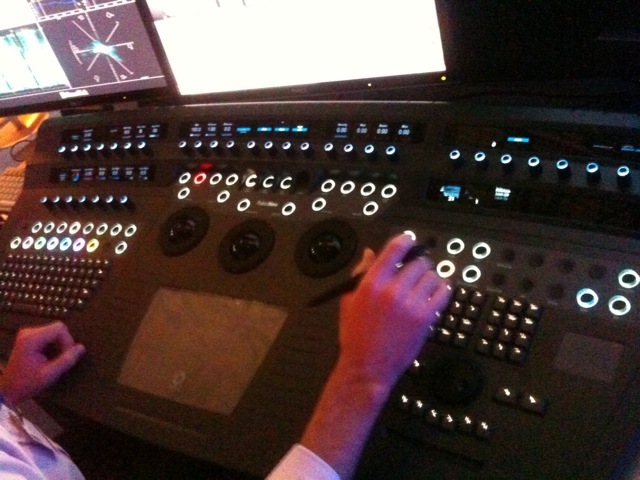 Speaking of Resolve, one of the only two control surfaces it supports is made by Tangent Devices, and I chatted with Andy Knox who showed me some of their technology. Tangent has been generous enough to loan me a Wave while I beta tested Resolve, and I’ve been pleasantly surprised at the performance and feel of this low-cost control surface solution. Interestingly, it turns out that the Wave uses exactly the same push-buttons as the more expensive CP200-series control surface, and that the trackballs, though smaller, also come from the same factory as the trackballs on their other products (fun fact, apparently it turns out that all the balls come from the same cue-ball factory). The new laser trackball reading of the CP200 series control surface. When I asked about the red color of the Wave trackballs (I don’t particularly care, but I’ve read some other folks complain), it turns out that the laser pickups used in the design of the Wave required the colorful texture to work, hence the brighter coloration. However, in other news the CP200 has just been upgraded and redesigned to use newer laser pickups that will in fact work with black balls of a specific type. The new CP200 trackball mechanism also has user-configurable inserts that let you adjust how much or how little drag the trackballs have when you spin them, according to your preference (a nice touch). Lastly, they shared a couple of “technology demos” they had on hand. 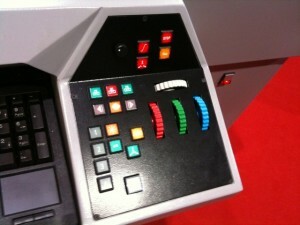 One was a “virtual” tangent control panel on an iPad, complete with spinning trackballs and rings. It looked similar, if simpler, to something I’ve been beta testing for Graeme Nattress (I’ll talk more about that in a future post), except that Tangent’s iPad app is simply a control surface that controls another grading application via that application’s API (they were showing it controlling Color at the show). It was very cool, and I liked how it could potentially give users who don’t initially understand the value of a true physical control surface a taste of what it’s like to manipulate multiple parameters at once (which it can do). They also had another tech demo of a driver that allowed a single physical trackball (like a Kensington trackball) to control each of the shadow/midtone/gain color-balance controls via keyboard shortcuts. Again, it’s a very cool way to give people a taste of the full-blown functionality, without having to spend $1400 on something they’re not sure whether or not they want. They asked me if it was something worth distributing and I said heck yeah, joking that it would be a gateway drug that would probably get a lot more folks who are dabbling in color correction to eventually pony up for a panel of some type of their own. I stopped by the Tektronix booth to have a look at their WVR4000/5000 series of low-cost rasterizer videoscopes. Colleague Robbie Carman told me that a firmware update had enabled four-up display and I was interested in seeing this. However, due to performance limitations, only two of the four quadrants can be set to video scopes, with the other two quadrants restricted to audio diagnosis and/or image display. This is still an attractive device for the price, especially since you get the Tektronix Diamond and Arrowhead displays for gamut checking, but it does mean that you can’t have a YRGB, Vectorscope, and Diamond scope onscreen all at once; you’ll need to switch one of your quadrants back and forth. If you do want the full shooting match, you’re probably best moving up to the WVR8200/8300 series rasterizers, which are more expensive, but provide you with all necessary options including Dual Link monitoring, if you need it. Talking about Video Scopes, I took another look at the BlackMagic UltraScope at the show, and was pretty impressed. No latency that I could see, lots of solid options for customizing the display, and on top of that they were showing off a beta of the application that adds actual gamut checking (using the existing displays) and an alarm log that reads VITC timecode for tracking QC errors, which is fantastic to have in a broadcast environment. Unbeknownst to me they’ve already released the PCIe version for the Mac (Intel only), and as I’ve got a spare 2007 8-core Mac Pro laying around, I think I’ll give it a shot on my home setup to see what it’s all about. 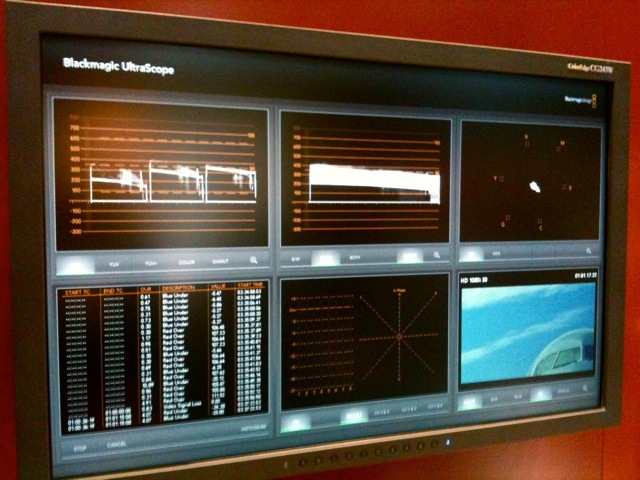 The Blackmagic UltraScope, showing the QC error log (in beta). Robbie also pointed me in the direction of Eyeheight, makers of hardware legalizers that I’m told are popular in European post houses, who have distilled their uncompromising video legalizing technology into a Final Cut Pro plugin called complianceSuiteFC. Simply put, it’s a broadcast safe filter that works, and judging from the demo they gave at the show, this plugin doesn’t let anything through, at all. It’s not cheap at a suggested $1500 USD for the HD version, and Robbie pointed out that render times can be a bit long from what he saw, but if you’re working in a tapeless environment providing digital deliverables to major broadcasters and you don’t want to deal with getting a program bounced, this may be a good tool to have in the box. I went over to the Nucoda booth to take a look at FilmMaster, and in particular to see the new control surface they were showing off. I didn’t get any really good pictures of it, but it’s massive, has as many controls as I imagine anyone could want, and includes touchscreen LCD displays enabling modal button remapping, although I didn’t get the opportunity to see the panel in action. My general opinion about control surfaces is that they’re like instruments, and it’s hard to form an opinion about a surface’s effectiveness without learning it, and in fact learning it well enough to get fast. On top of that, each vendor’s surface is tailored to the way their particular application works, so that’s another thing to factor in. However, it’s not lost on me that the touchpanel displays allow a degree of customization and future-proofing (adding control surface functionality for features that haven’t been imagined yet) that is interesting to have. 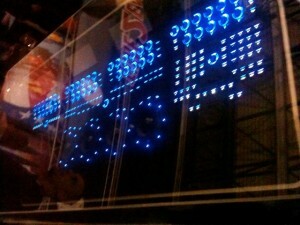 A horrible picture of the new Nucoda control surface. Having seen FilmMaster in action a bit more at this show, it was interesting to see how they integrate the kind of layer-based compositing (complete with transfer modes, opacity settings, alpha channel support, and blue/greenscreen keying) more typically seen in an NLE within a comprehensive grading UI. In general, I liked what I saw, and colorist Kevin Shaw drove the system with aplomb using one of Nucoda’s previous control surfaces. Elsewhere I met colorist and software developer Steve Shaw at the Mystika booth. He’s bullish on Mystika, and it certainly looks like they get a ton of performance out of a single GPU system. Interesting to see their take on integrated editing/compositing/color correction, it certainly looks like a complete toolset, although I didn’t have the opportunity to see the color correction component in action as they were pushing the new 3D capabilities that are now integrated into the software. Incidentally, I hadn’t realized this, but Mystika is from the same developers who created Jaleo back in the day, a name I’ve not heard in a while. Steve’s shared some of his knowledge of 3D LUT generation software with me for the book, and he mentioned that his LightSpace color management suite has been doing quite well (in fact Quantel announced LightSpace support), which is nice to hear as it’s one of the lowest-cost professional color management solutions around, and has a lot of flexibility. One of these days I’m going to get around to giving it a whirl and putting it through its paces. He’d also mentioned a high-end Norwegian video projection company called Projection Design, so I went to check them out. They were showing a Cineo35 series 2.5K (as in 2560 x 1600) that supports the full range of true 2K resolutions, using DLP technology. It looked great (although show-floor light leak was unflattering, as you can imagine) and looks like a solid mid-range solution for facilities that want a compact grading theater environment without having to install a ventilated and sound-proofed projection booth. It comes with HDMI 1.4 (which by the way supports 2K resolutions), but 3G SDI is available as an option. While I was wandering around, I also stumbled upon RTI Film Group, one of the last companies still making Film Analyzers and accessories, who are also in both the optical and digital film printer/scanner business. I used the Hazeltine-style controls (RGB and Master click-wheels) for the first (and probably last) time in my life. It was also cool to see a unit retrofitted with digital accessories and a flat-panel screen. I also took a look at their new LED film recorder. I’d not been paying attention, last I knew film recorders either used CRT or lasers, but now LED lit film recorders use LCOS technology (similar to my RS2 projector, in fact), have much more longevity then lasers, and none of the alignment hassles of CRT. The resolution is limited to 2K, but 2K is in wide use by the industry and as a filmmaker I sure wouldn’t complain about having a 2K film print. It’s not all digital just yet. 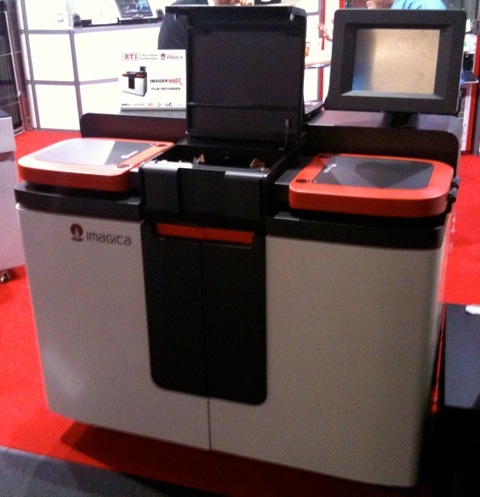 The Imager HSR digital film recorder. Although apparently in Norway it’s about to be. Someone I know in that part of the world mentioned that in six months every cinema in Norway is going to be digital. I’m curious to see what the mix of projectors is going to be, and how many of those screens will be 3D capable, but that’s a pretty big milestone, and ensures that DCDM deliverables will be of major importance to post houses serving that market. On the other hand, it sounds like HD broadcast in Europe is extremely slow to roll out. Another colorist I met from Switzerland told me there’s only one HD channel there—National Geographic. Now, to put things into context, most European countries have had higher-resolution widescreen television presentation for YEARS, so I imagine most viewers aren’t actively missing those extra lines of resolution. Still, this is the first time I’ve seen a new technology lag this far behind in Western Europe. It puts those PAL deliverables I’m occasionally asked to provide into perspective. One last thing I saw on the show floor, Logic Keyboard has shown Apple Color a little love, with a custom keyboard highlighting Color key commands. If you’re an avid Color user and you like the Apple keyboard (they buy unprinted Apple keyboards in bulk and print their own designs on top), you can now have a custom version. A custom keyboard for Color. Finally, I attended my very first Supermeet in Amsterdam, and Daniel Berube was a gracious host. I didn’t manage to sit in on any of the presentations (though I had merry chats with a couple of the presenters during the mid-way mingle), but a highlight of the evening was a conversation with colorist Warren Eagles (whose notable work includes “Lock, Stock, and Two Smoking Barrels”) about his experiences using Apple Color (he uses it with low-budget personal clients) the training he does via the International Colorist Academy (their class list is impressive, you should check it out), and the possibilities afforded by the remote grading capabilities of DaVinci Resolve now that it’s less expensive to set up the remote station that a faraway client would need to watch what you’re doing. It’s great to see a high-end colorist embrace a more affordable toolset like Color, and use it to get high-quality work done. Waiting for the bicycles to pass in Amsterdam. Additional Notes—Much love to Caffe 500 (Albert Cuypstraat 59) for letting my friend Andy and I close the place down on Monday night. Fantastically authentic and fresh Italian food. Just go there. Also, Hotel V Fredriksplein was a fantastic place to stay. The rooms are small and efficient, but comfortable and the beds are bigger then in London hotels. The staff was uniformly friendly and helpful, the lobby is an excellent place to hang out on a late rainy night, and it’s in one of Amsterdam’s most relaxed yet entertaining neighborhoods. As a Shake user, I learned to love the explicit image processing organization that node-based compositing afforded. Never mind trying to figure out which precomp corresponded to what part of the composite; one look at a well-organized node tree and you can see exactly what’s going on. Furthermore, once you get the hang of using nodes, you can begin to work out your order of corrections in advance in a classic programmer’s tactic; flowchart your way through a complicated series of operations in order to think them through, except in this case, the flowchart is also the result! I’ve been discussing node based operations with my friend and colleague Robbie Carman, who’s another DaVinci Resolve beta user, and in the process thought that it might be interesting to share some of my favorite operational aspects of Resolve’s method of node-based correction organization. 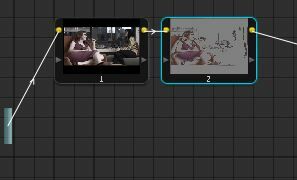 Similarly to the node-based Color FX room of Apple Color, node-based corrections in Resolve aren’t for the actual compositing of multiple images with one another. They’re for organizing and combining the different corrections you want to make to your image. Before I dive in, here’s a quick overview of how Resolve uses nodes. Every clip has a corresponding set of corrections within a “Clip” tab. This tab is Resolve’s node view, where each correction is represented as a rectangular node, with a single input and a single output, which can be seen as little yellow dots to the left and right of each node. The flow of image data goes like this: The left-hand bar is the source image on Disk. Connection lines (with small directional arrows) feed image data to the first node in the tree, represented by a thumbnail showing what that node is up to (literally; the correction performed by each node is represented by its tiny thumbnail if your eyes are sharp enough). Connection lines also connect each node you use to one another, feeding image data down the line until the last node is connected to the right-hand bar, which represents the final output. 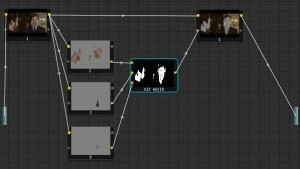 In a very real way, a serial cascade of image processing nodes like that shown above is like a stack of filters in After Effects, Final Cut Pro, or Avid. The output of the top filter feeds the next one in the stack, and so on until you reach the bottom. You can think of nodes as a similar series of image processing operations. More poetically, you can think of nodes as individual waterfalls along a stream of image processing. Each waterfall alters the flow of data, which in turn feeds the next part of the stream, until you reach the end. The key thing to remember is that, depending on what type of image processing operations you’re doing, your order of operations matters, a lot. One of the most frustrating things about working in Color is the occasional instance where I discover my order of operations isn’t quite right, usually after I’ve done several corrections. For example, let’s say a primary correction (the first node seen below) blows out the highlights in the sky. When using Apple Color, my solution in these cases has been to save the Primary correction to the bin, reset the Primary In room, open the Primary Out room, and apply the correction that I saved there, effectively swapping the PI and PO rooms. At that point I can use a secondary of some kind to lower the highlights before I boost the rest of the shot, and so I get to preserve maximum image detail. In Resolve, this is an even easier operation. All I do is either add a node with which to perform a secondary sky isolation operation before my primary correction (or, if I’d already tried a later secondary correction with no success, swap the two node’s positions in the tree). This allows me to isolate and duck the levels of the sky before boosting the overall levels of the shot in the next node. The result is smoother, more natural, and preserves all the image data that’s available, which is always a bonus. This gives me exactly what I need in terms of image processing organization. Now, I grant you there are several other ways of dealing with this particular scenario, but the point is that, using nodes, I control the order of operations, not the application. Here’s the other nice thing—you can use as many nodes as you like to organize your grades. I like to keep significant operations within separate nodes, so I know where I need to go when I want to make an alteration. That means I might have one node doing a basic corrective grade, a second node adding a bit more warmth and contrast for stylistic effect (as I’ve done in node 3 of the previous example), and then a third node where I add a perhaps questionable alteration that was requested by the client, that I think they might backpedal on later. I could have done the entire series of operations within a single node, but by keeping these three operations separate, I’ve got more options regarding which aspects of the grade I want to continue tweaking, and which I can turn off entirely without affecting the rest of the grade. Or you could apply them as a parallel operation, with three stacked nodes feeding a Parallel node. This one’s easy. Remember I mentioned that the leftmost bar in the Clip tab represents the original state of the image? Well, if you’re adding a secondary operation via a parallel node structure, you can choose whether you want to pull your key off of the original state of the media, or from a particular node of the tree, simply by connecting that node’s input to the source you want to sample. For example, suppose my look for the primary correction performed by node 1 results in a high-contrast, low saturation image. Even though node 1 is doing what you want it to, the result is that the image is in a crummy state to have to pull a key off of. Now that we can get a better key, it’s easy to manipulate the color of the dress however we like, and then feed it back into the image. So there you have it, complete control of image sampling, all through the power of selective node connectivity. I love me some nodes. Photography by Kaylynn Raschke. Special thanks to Gal Friday and Sasha Nialla for modelling. 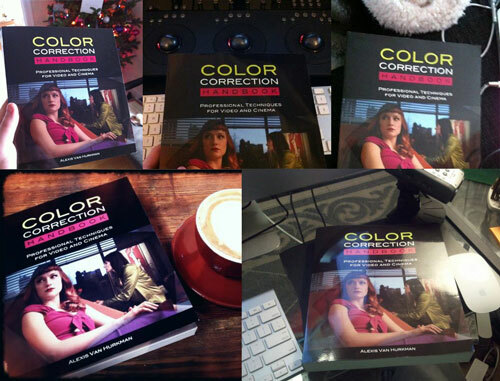 Images excerpted from my new book, Color Correction Handbook: Professional Techniques for Video and Cinema. Writing. Writing. Sleeping. More writing. The periodic grading gig interruption. Yes, it’s “the last month of writing my book,” and just like every other book’s last month, it’s a round-the-clock marathon of typing, research, setting up example projects that look good and explain the topic at hand, screenshot-taking, and illustration making; all amidst a vague feeling that I should be getting more sleep. However, amidst all the toil, there are still magic moments, and today was the culmination of a plan I’ve long had to more fully examine and portray the possibilities of human skin tone (one of the chapters of the book I’ve put particular emphasis on). After I identified the list of complexions I wanted to document, photographer Sasha Nialla assembled a terrific roster of models, and with me playing client shot all of them under controlled lighting conditions, allowing me to show an apples to apples comparison within the book of the basic categories of complexion, for analysis and consideration. My personal criteria for how good a technical book I’m writing is, happens to be the same as that I use for screenplays—if I’m having fun writing it, then it’s probably turning out well. 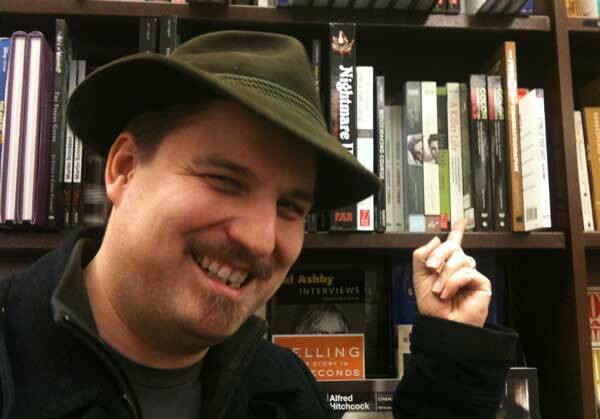 It eases my mind that I’ve been getting solid feedback from Joe Owens, who generously agreed to be my tech editor, lending his experience (and subtle humor) in the evaluation of my assertions and techniques. And I must give credit to Peachpit Press, and my editors Karyn Johnson and Stephen Nathans, for continuing to provide the time, encouragement, and editorial support to get things right. These damn books aren’t easy to make, and I’m glad that PeachPit has lent their support. Furthermore, I’ve been getting terrific support from DaVinci (who also graciously let me into their beta for Resolve on OS X), FilmLight, Iridas, Assimilate, Quantel, Tangent, DSC Labs, X-Rite, Light Illusion (Steve Shaw), and of course various friends at Apple, alongside others I am to my shame forgetting. All of which has enabled me to meet my goal of creating a color correction handbook that is truly platform agnostic, and aimed squarely at the budding professional colorist (and the casual colorist who aspires to professionalism). If you’re a complete beginner, this book should orient you with a foundation in color theory and basic operations; if you’ve been grading for a while, this book may fill in some conceptual gaps, provide additional theoretical food for thought, and toss out some nice tricks that you might find useful. My criteria for which applications to discuss in the book has been based on color control surface compatibility, on the premise that a) if you’re a dedicated colorist, you’ll be wanting to use one, and b) most grading applications that are dedicated to the task are compatible with one or another, either custom made (Resolve, Baselight, Quantel) or off-the-shelf (such as a JLCooper, Euphonix, or Tangent Wave surface). On the other hand, most of the techniques discussed can be implemented using Colorista, Final Cut Pro’s Color Corrector 3-way, After Effects, Color Finess, or any plugin with 3-way color balance, HSL Qualifiers, and Masks. No matter where you’re making your corrections, there’s bound to be some information that will be useful to you. So that’s why I’ve somewhat fallen off the edge of the earth. I’m due to finish soon, and look forward to getting my weekends back, getting the book out to the public, and maybe doing a book tour or something and seeing what you folks think of it.